On Friday two-thirds of the Irish electorate voted to remove the discriminatory Eighth Amendment from our Constitution. It is no wonder Galway West and East both voted Yes by such large majorities. We have seen firsthand the negative effects of the Eighth Amendment in our county. Our victory is bittersweet as we must think of all those who suffered in the 35 years the amendment gripped Ireland. When the result was officially announced we thought of Savita Halappanavar whose death at the hands of the Eighth has left lasting scars on Galway’s residents. Hundreds of thousands of people in Galway voted Yes voted with her suffering on their minds, alongside the memory of the thousands of Galway women who travelled since 1983, who took safe, but illegal, abortion pills, or who were not afforded quality maternity care because of the Eighth Amendment. Our fight to remove the Eighth Amendment from the Constitution was anything but quiet and we will refuse to be quiet until every person who needs an abortion or maternity care in Ireland can access one freely, safely, and legally. 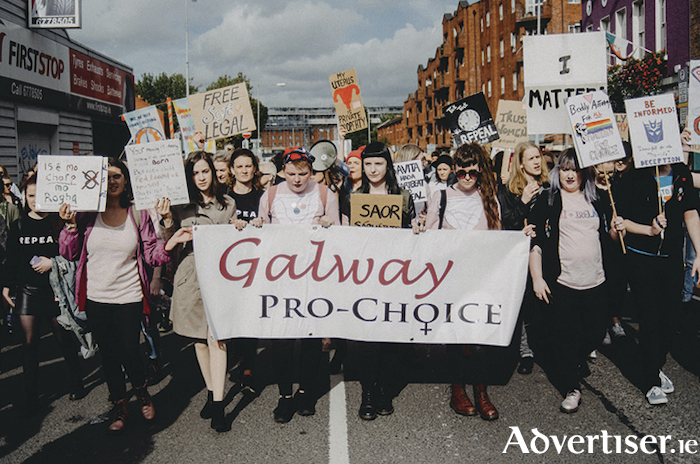 The Irish people voted overwhelmingly for abortion on request up to 12 weeks and Galway Pro Choice will work to ensure that Galway TDs do not obstruct the Bill or try to restrict access to abortion in any way. We reject Simon Harris’s proposal that an abortion could cost more than €300, a cost that is out of reach for many in Ireland. The proposed GP led service should be provided freely to any woman who needs it like other maternity care services. We must continue to fight conscientious objection and ensure that the women and pregnant people of Galway do not suffer if their GP refuses to prescribe abortion pills. Most GPs will provide care to their patients but for the minority who refuse, they must refer any woman who comes to them seeking an abortion to an accessible GP or primary care unit who will help them. We also reject the criminalisation of medical professionals within the heads of Bill as this will continue to act as a chilling factor in providing care. We must continue to look to the World Health Organisation’s guidelines that states both conscientious objection and mandatory waiting periods are not medical best practice.